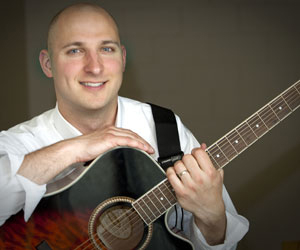 Read as Andrew Knight gets JobShadowed about his career as a music therapist and professor. You can find Andrew on the Twitter feed in the sidebar of this interview. I am a board-certified music therapist who became a professor. I used to do more clinical work, using music to work with people with special needs, all ages and abilities. Now I mainly teach students how to do that, supervise their real-life experiences working with clients during the school year, and research what techniques and approaches work better for music therapists. Most of my work is outside of the classroom, like any college student, really. We may get together twice a week for 50 minutes each (a 2 credit course), but I’m prepping a lecture, experience, or assessment (quiz or test) or grading for a few hours outside of that class. Most professors have teaching as a majority of their contract, but that also includes doing music therapy sessions in the community for free so students can observe and eventually learn to do some of the techniques they see me use with clients/patients. The rest of the time, I am reading research, preparing or conducting a research study, or serving on committees for the university or the American Music Therapy Association at the national or regional level. I like academia because every week is different and flexible. I don’t have to punch in and out on a clock. Obviously, class times are set, and times to see clients are pretty well set in the fall and spring semesters. But I can rearrange meetings outside of those set times, read research whenever I can, write papers, do grading, etc. whenever it fits my schedule, so there is no 9-5 feel to it. I was a music performance major and psychology minor. Google “music” and “psychology” and you’ll inevitably see “music therapy” pop up, and the more I learned about it, the more I felt like I could music to do some tangible good for other people who had special needs. I see the best potential of people. Someone with Alzheimer’s disease might spend most of their day confused and agitated, but during a music therapy session they can really seem alive again. Kids with autism can be frantic, disengaged, or inattentive, but in music therapy sessions, I can see what they are really capable of. Some people can dismiss the term “music therapy” out of hand, like a foo-foo aromatherapy or rock therapy or any of the thousand other things companies market as “therapy” to make money. It’s not pseudo-science, it’s a social science with a research base. As a professor, I’m paid by the university, of course. However, I worked for health care facilities and school districts as a salaried employee or contract worker. However, music therapists may also receive payment from insurance companies who cover individuals that we work with. Music therapy salaries vary by placement. If you work in a school district, you make money like a teacher does: less salary, more benefits, summers off. Work in a hospital, make more money, less benefits, less off time. About $37,000 in year one as a first year music therapist at a nursing home. Music therapy is a bachelor’s degree entry level profession. Usually four years of coursework, half a year of internship, and passing a board certification exam (www.cbmt.com). Shadow a few music therapists and see what their days might be like. Find out what motivates you about working with people with special needs, and volunteer to do that in some capacity while in high school. We conduct drum circles only, that we do therapy only with musicians, or that we just do singalongs to help people feel better. I’d like the profession to double in size, be reimbursed and accepted like physical and occupational therapies are, and I’d personally hope my research can be used to improve many people’s lives. Hello! My name is Katherine Clark and I am a college freshman really interested in Music Therapy. I was first interested in PT but since I have been into music my whole life and have been recording and writing my own music as of the last few years, I’ve felt God pulling me towards music therapy. Does anyone know of a Music Therapist in the Charlotte area that does job shadowing? I am a professor of veterinary medical technology (VMT) at Wilson College in Chambersburg, Pennsylvania. One of my advisees has decided to change her major from VMT to musical therapy. I was hoping that we would be able to design a special major for her at Wilson, but it is not possible at our college. My advisee is planning to meet with me this week to have me help her find a therapist that she could shadow to learn more about this profession. Would you have any suggestions for us as we search for a therapist who might be interested in allowing her to shadow them? Hi Carol – thanks for the comment. Yes, all music therapists take a board certification exam to have our credentials MT-BC (Music Therapist-Board Certified) after our name. We try to make sure our colleagues in other professions are aware that all of our scopes of practice are different, yet have overlap. So while a music therapist may work on communication goals, it doesn’t make her a music therapist who is doing speech therapy. Similarly, another clinician who happens to use music in a session with a particular population isn’t “doing” music therapy, but may be using music therapeutically within their own scope of practice. would tell me how to proceed, I would appreciate it very much. Thank you.